We’ve had an overwhelmingly positive response to our fully automated, completely customizable online private label program for wholesale market customers. Many requests have poured in for a similar application to suit the needs of all our customers, whether they are looking for unique wedding favors, sophisticated corporate gifts or something distinctive to mark a special occasion. This month, we launch Create Your Own Oil or Vinegar Custom Labeled Bottles Online in The Olive Oil Source Boutique. 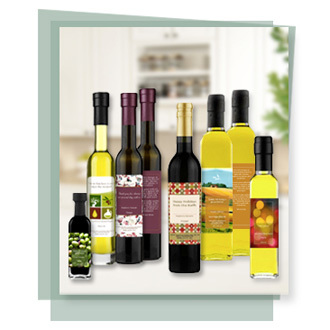 The easy online order system allows any customer to choose from 15 of the most popular olive oils and vinegars in our line, and select the perfect bottle size from six different options and six shrinkwrap colors to match a customizable label. Any sized order can be shipped within one week, whether you want just one to celebrate a birthday, or 100 for that special party or event. It’s even a great solution to keep some on hand for that last minute dinner party invitation or housewarming. Best of all, it is fun to see your own creation being built before your eyes. As you make personal selections, a large-scale image changes to display your choices. You can experiment with different content, bottles, shrinkwraps and labels with your own message until it looks just the way you envision. We’ve provided thirteen different labels to suit all sorts of occasions, so there is bound to be one that’s just perfect for you. We invite you to Create Your Own Oil or Vinegar Custom Labeled Bottles Online in The Olive Oil Source Boutique. It’s a simple five-step process and in just a few minutes, you could solve all sorts of problems when wondering what to give when you are looking for that perfect gift that can only come from you.